Free mulch around young trees. Good mulch is expensive. You can get good native mulch from Nature's Way Resources for fairly cheap, but you have to pay to have it delivered. You can buy it from the nurseries around town, but it can cost $5-$8 per bag. People think I'm crazy, but I have found the best source of mulch to be my neighbors. All over my neighborhood, people spend hours every weekend raking up their leaves and pine needles, stuffing them into plastic bags, and leaving them on the curb. I see that as free mulch. Every Sunday after church I hop in the truck and take a spin around the block. There are so many bags of leaves that I have never come home with less than full pickup bed full. I can even be picky about what I pick up. For example, I always prefer leaves to pure pine needles, and I try not to pick up grass clippings because you never know what chemicals people use on their lawns. Also, as a rule, I only pick up clear bags that I can see into. If you pick up black plastic bags, you may wind up bringing home trash you don't want (beer cans, etc). Lately, I've noticed several of my neighbors have started putting out their yard waste in large paper sacks. I think this is great because it is less plastic for me to throw away, and I can just compost the sacks. I use the stuff I pick up as mulch around my fruit trees in the back yard, but not the front. While it is very effective and nutritious mulch, it doesn't look as nice as the wood chips, and I don't want the Homeowner's Association on my case. I've found that my fruit trees respond very well to this kind of mulch. Most people just go buy one huge thing of mulch and dump it on their plants once or twice a year. This way, you can continuously add little bits of organic matter around your fruit trees, just like it happens in nature. When adding mulch, I typically just throw down a handful or two of cottonseed meal (my cheap fertilizer of choice) or some composted kitchen scraps (discussed below), and then add the mulch. It breaks down fast, retains water, suppresses weeds, provides trace minerals and nutrients, and above all it is free!. I also feel good knowing that I'm keeping all of that material out of local landfills. Most of us throw away tons of food scraps all the time, such as banana peels, coffee grounds, little bits of leftover salad. However, these little bits of leftover food can be composted into dynamite fertilizer. You already bought it, why not get your money's worth by turning your food scraps into something useful instead of throwing them away? Another big benefit is that when you compost those items, your trash won't smell any more. When I talk about food scraps, I really mean to say vegetables and breads. Don't try to compost cheeses, meats, or greasy foods. These won't compost well and will stink. Paper towels, orange peels, apple cores, and carrot tops are all perfect for composting. We have a dog who gets to eat all the leftover meat scraps (dogs are carnivores after all), so almost no food goes into our garbage and it never smells up the house. In addition, because less goes in the trash, I don't have to take it out as often. We also have curbside recycling of plastics, cans, and cardboard, so by composting our food scraps our family of four only produces about 1 kitchen size trash bag every week. There are lots of ways to compost your kitchen scraps, but if I have found that if it isn't easy and convenient, I'll get lazy and stop doing it. This is the way I've found to be most convenient: I bought 2 32-gallon and 2 20-gallon plastic trash cans from Home Depot, some cheap plastic spigots, two bricks, and two cinder blocks. I took the 20-gallon cans, and drilled several holes in them so they looked like colanders. Then I drilled out one hole near the base of each of the 32-gallon trash cans and installed the plastic spigots. After that, I set the 32-gallon cans on cinder blocks, put bricks in the bottoms of each, and put the 20-gallon cans in on top of the bricks. The 32-gallon cans have snap-on lids to keep out bugs and rats, etc. Here's how it works: During the week, I collect all our food scraps in plastic yogurt containers I keep on top of the refrigerator. We usually fill up between 6 and 8 containers every week. 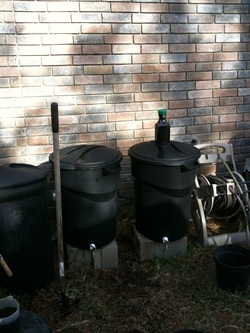 On the weekend, I take the containers out to the composters to empty them. I open the composter I'm using, dump in the kitchen scraps, cover them lightly with dry leaves and/or pine needles, and snap the lid back on. That's all there it to it. I do this every week until the composter is full, which usually takes approximately one month. Once one is full, I just leave it alone to compost in place while I fill up the second composter. When the second composter is full, I empty the first one out. By this time, the food scraps in the first composter have been breaking down for a couple of months. 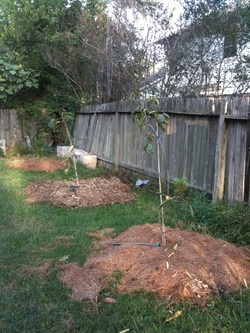 I like to bury it under the mulch around my fruit trees, or mix it up with leaves that I plan on using as mulch. Either way, I'm turning little scraps of food that might otherwise go to the landfill into valuable soil fertilizer I would otherwise have to purchase. A quick not about the spigots: I used to keep the spigots closed, add water when I added kitchen scraps, and and periodically collect "compost tea" from the composters. However, over time I found that the food scraps didn't compost very well if there was too much fluid in the trash can, and I got some bad odors. So now I just leave the spigots open all the time and don't add any water. This way, any excess fluid just drains out , and my compost stays aerated and doesn't stink.